Source: James Khoo Fuk-lung’s (邱福龍) The Sage King，Issue 1, 2002. Certainly, Nezha 哪吒 has found some success through his own films and cartoons, such as the classic 1979 Cultural Revolution parable, Nezha Conquers the Dragon King 哪吒闹海. And arguably Guangyu 關羽 , Zhuge Liang 諸葛亮, and Liu Bei 劉備 etc of popular video games such as Dynasty Warriors 真‧三國無双 and manhua series such as Lee Chi Ching’s 李志清 Record of the Three Kingdoms 三國志 share more in common with their mythological counterparts of Chinese folk religion than they do with the real-life historical figures whose names they borrow. I take it and down it in one. “We couldn’t possibly let them go,” the priests said. Victor Mair has written about the use of animal sound in the song on Language Log and Boing Boing and others have suggested that it could become the “song of the year,” or “the next Gangnam Style.” While Wang’s success is nothing to scoff at, as a point of comparison, Psy’s hypnotic ballad clocked over 10 times as many hits in the first two months after being posted on YouTube, meaning that “Cluck Cluck” is literally an order of magnitude less viral than the Korean megahit. The Mirror 11/17 The singer Wang Rong, who first rose to fame with her 2007 song “I’m not Huang Rong” but has since fallen off the radar, is attracting attention again with her latest ‘viral tune’ “Chick Chick.” The song, which is entirely made up of lines like “chicken cluck cluck day,” “little chick cluck cluck day,” “rooster whoa whoa whoa” has attracted both both attention and scorn. Yesterday, Wang Rong agreed to an interview with The Mirror in Beijing. The Mirror: How did you come up with this song? Wang Rong: This song originally came from a dream I had. It was a really happy dream, where kittens, chicks, and ducklings looked like they were having a meeting, talking about really trivial stuff, like oh, today I laid an egg, and then I lost something, clucking and quacking away in disagreement. It was really cute. I could understand what they were saying though, just like in fairy tales. So when I woke up I decided I wanted to turn my dream into a song. Going into ICAF, I really didn’t know what to expect, but like other first time attendees I was immediately struck by how friendly and outgoing everyone was. There was very little sense of the hierarchy that one often gets in more hoary academic circles. Instead, I found myself happily immersed in a group of fellow comic book fans and scholars, who were as excited to hear about my research as I was to hear about theirs. As compared with the academic conferences and comic cons that I’ve attended in the past,1 it felt a little bit like a small indie comic fest, with the key difference being that the discussion of comics was being placed on the same level as the production of comics. 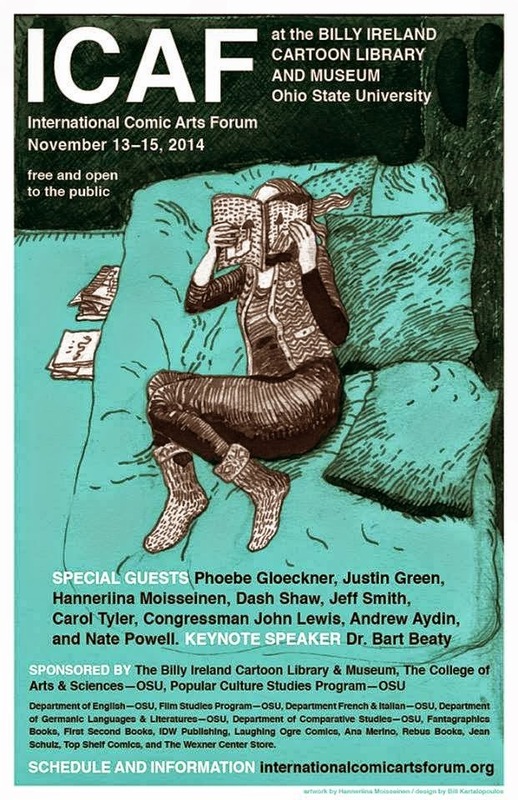 I think this is something that other, non-academic comic fests could learn from ICAF. Unlike other media, such as film, I’ve found that the line between creator and critic is much less well-defined in comics. 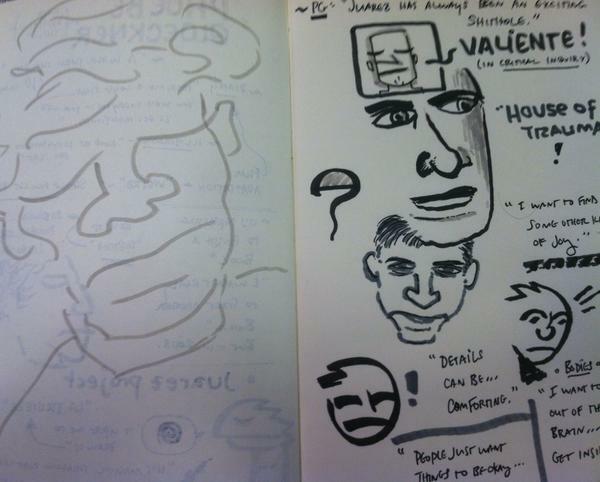 Sitting in the audience for panels, I noticed many attendees doodling in the notebooks provided by Ohio State. This artwork was enthusiastically shared online alongside more traditional commentary, and one presenter even made a comic book version of her presentation! The other aspect of ICAF that really struck me was the commitment to expanding the conversation beyond Anglophone North-American comics. 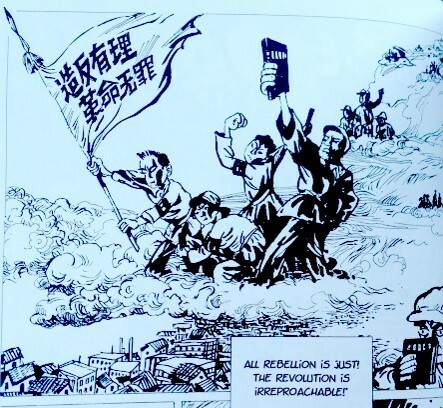 During my panel, for example, my presentation on Li Kunwu and Philippe Ôtié’s graphic novel A Chinese Life, got people talking about the impact of State censorship on film and comics. Paul Morton’s presentation on the Serbian cartoonist Aleksandar Zograf likewise brought up questions of the role of comics in representing history, as did Elizabeth Nijdam’s presentation on Anke Feuchtenberger and other post-1989 East German cartoonists, and Héctor Fernández’s engaging presentation on the Argentinian comic book Alvar Mayor. 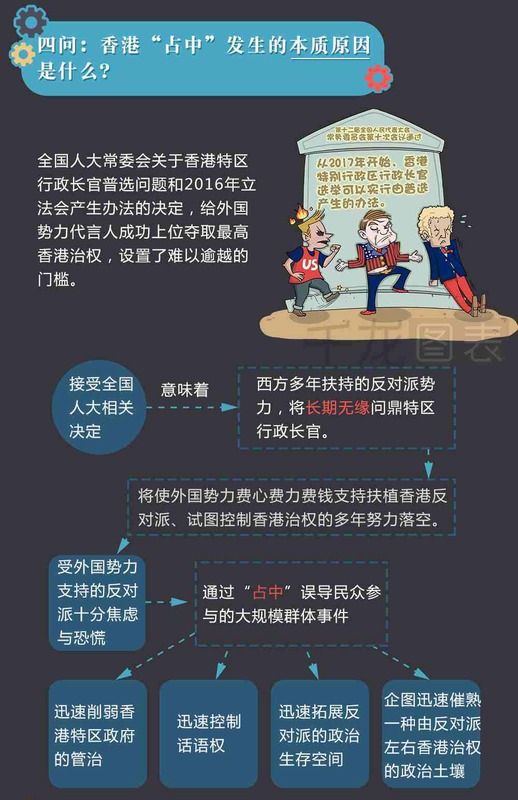 This is part 2 of a five part translation of infographic referred to as the “Hong Kong ‘Occupy Central’ Ten Questions Infographic Version” 香港 “占中” 十问 漫画版 that was published on Weibo Friday, October 4, 2014, in response to the then ongoing Occupy Central protests in Hong Kong. Read more about the background of this info-ganda here. Question 3: Why do we say that the central government’s basic policy guidelines regarding Hong Kong haven’t changed, and will not change, besides which has always been Hong Kong’s greatest supporter ever since it’s return to the mainland? • Unswervingly persevere in safe-guarding Hong Kong’s long term prosperity and stability. 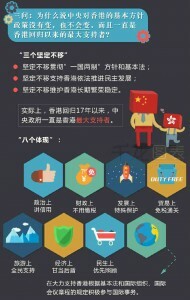 [Box] In reality, for the last 17 years, the central government has been Hong Kong’s greatest supporter. In financial administration, do not collect taxes. In development, give special protection. 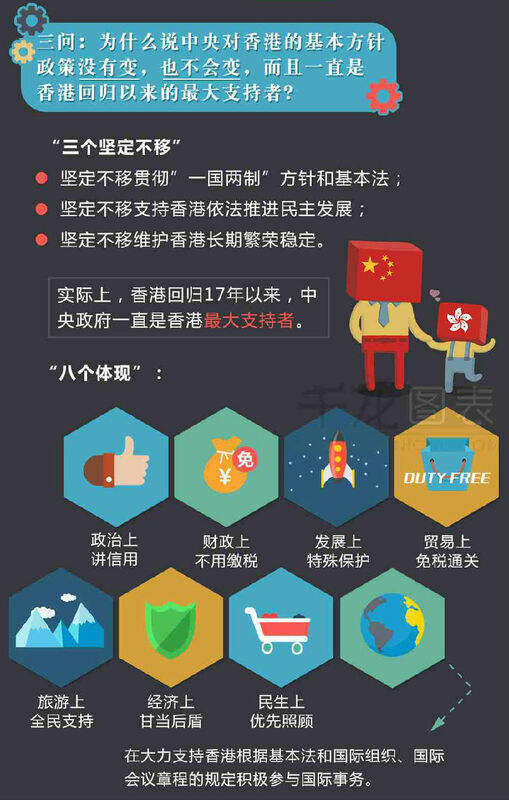 In trade, do not collect customs duties. In travel, support for all people. In economics, willingly provide backup assistance. In the lives of the people, first rate care. In accordance with Hong Kong’s Basic Law and the regulatory procedures of international organizations and international conferences, strongly support participation in international affairs. Question 4: What is the essential reason 本质原因 for “Occupy Central”? The Decision of National People’s Congress regarding the election of the Chief Executive Officer of the Hong Kong Special Administrative Region has give the representatives of foreign powers a difficult to cross threshold to seize the highest level of political power in Hong Kong. 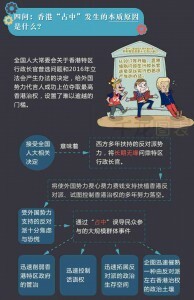 Quickly weaken the governance of the Hong Kong SAR. Quickly control the right to speak. Quickly expand the political survival space 政治生存空间 of the opposition party. Attempt to quickly warm the political soil of political power from the right and left of the opposition party. Question 1: How did Hong Kong’s “Occupy Central” start? “Occupy Central” refers to the illegal gathering which is currently taking place in our nation’s Hong Kong Special Administrative Region. “Occupy Central” The full name is “Occupy Central with Love and Peace” 让爱与和平占领中环, the abbreviation is “Peacefully Occupy Central” 和平占中 or “Occupy Central” 占中. March 27, 2013, proposed—–September 28, 2014, officially began. 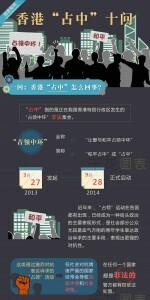 In recent years, the “Occupy” movement has appeared in many countries, and it has already become an important form of street politics 街头政治 it’s a important method for parts of society, in particular young and vigorous 血气方刚 students, to publicly express their political demands 政治诉求, and express even stronger spirit of confrontation 对抗性. The kind of excited confrontational expression of demands [shown by] the “Occupy Central” activity -> will often lead to bloody conflicts and social unrest in countries where there is mood of serious antagonism. In any country, they are always illegal and the police always have the right the use the law to deal 处置 with them. 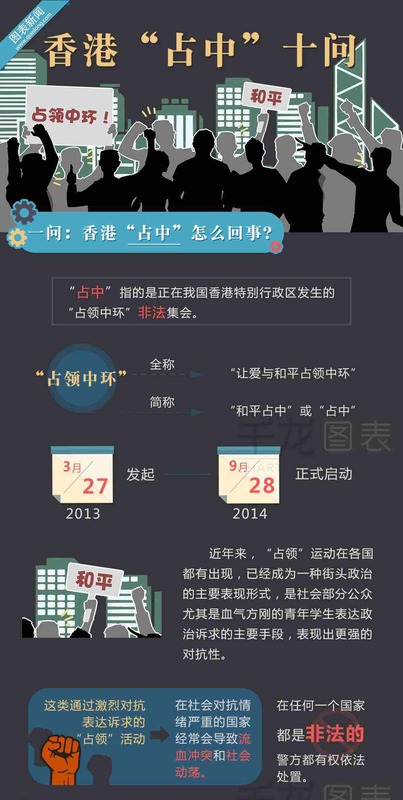 Question 2: August 31, 2014, what did the standing committee of the National People’s Congress 全国人大常委会 actually say about the decision made regarding the Hong Kong problem? 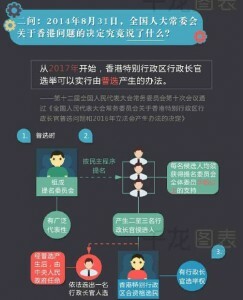 Starting in 2017, the Hong Kong Special Administrative Region Chief Executive Officer Election 香港特别行政区行政长官选举 can use the method brought about by universal suffrage 可以实行由普选产生的办法. 1. At the time of universal suffrage: A council is formed to nominate candidates which has wide representationality. 2. According to a democratic process, candidates are nominated. Every candidate must receive a majority support from the nomination committee. This will produce two to three candidates for the Chief Executive Officer. 3. Qualified voters 和资格选民 of the Hong Kong Administrative Region have the right to choose the Chief Executive Officer and according to the law will choose a Chief Executive Officer. Following the results of universal suffrage, the Central People’s Government will appoint 任命 [the winning candidate to the position of Chief Executive Officer]. Firsts are always controversial. 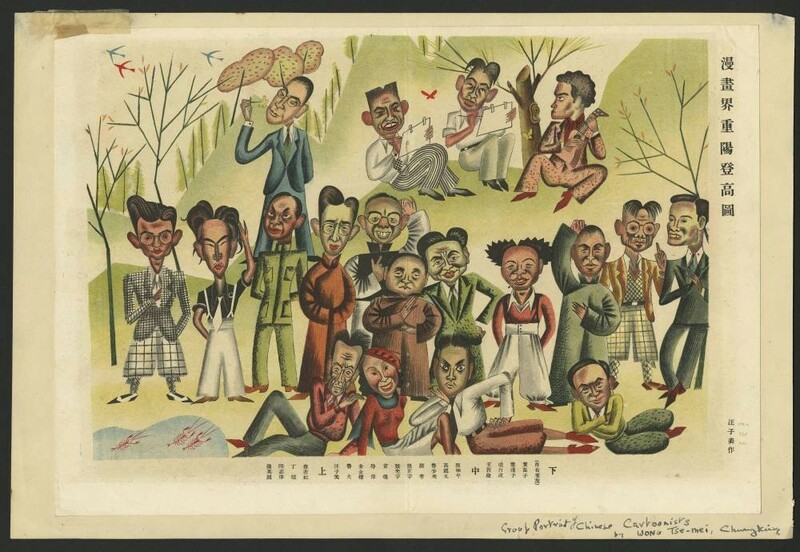 If the first Chinese cartoonist was the student of another, earlier cartoonist or proto-cartoonist, either by instruction or by inspiration, then he wasn’t really the first Chinese cartoonist, was he? Chinese scholars Bi Keguan 畢克官 and Huang Yuanlin 黃遠林, meanwhile, have “[traced] a genealogy back to such pre-modern proto-cartoons as stone etchings (shike 石刻) from the Eastern Han dynasty (25–220 CE) and humorous brush paintings from the Ming dynasty (1368–1644).”2 These stone etchings were likely based on earlier works in more ephemeral media, like wood or paper, which themselves would have found inspiration in the oral tradition. In short, it’s cartoonists all the way down. 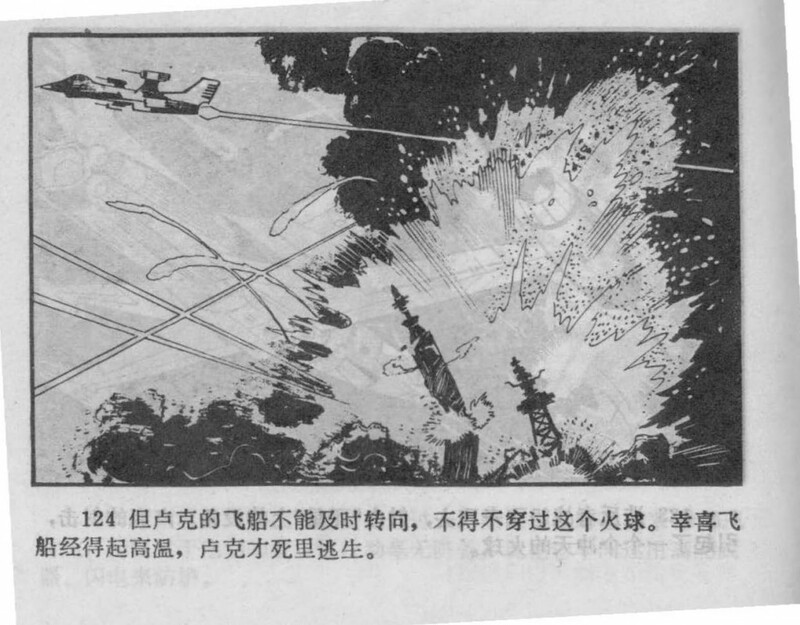 Between World War I and World War II China experienced it’s first boom in the production and appreciation of cartoons and manhua. 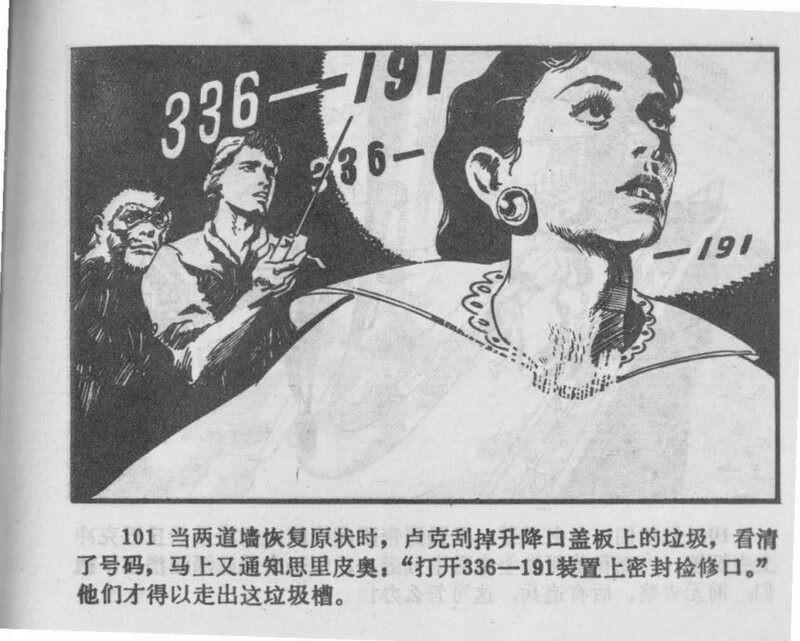 Although several notable cartoon and proto-cartoon publications predate World War I (and more importantly in China, the collapse of the Qing in 1911),1 it is the 1920s and 1930s which saw comic strips and cartoons reach their highest social currency in China, one that has perhaps yet to be rivaled even today. 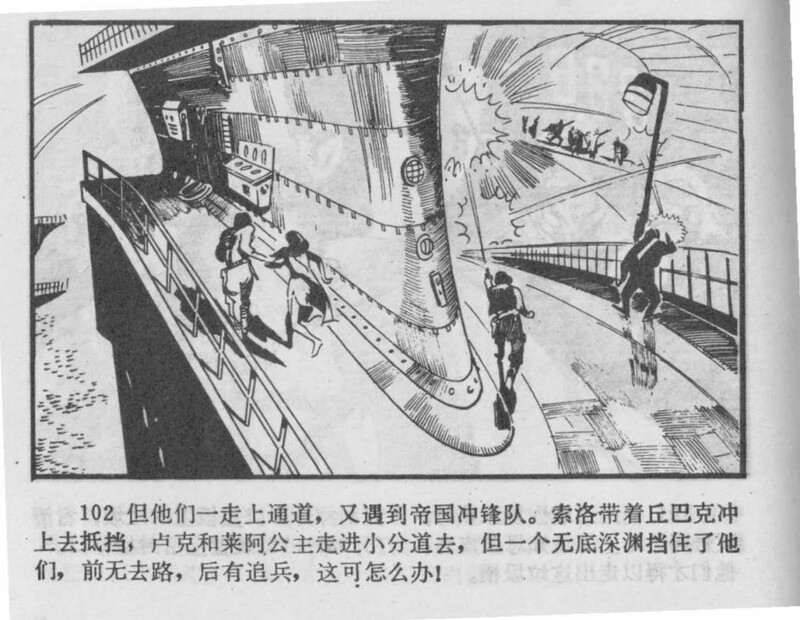 As I am currently in the process of writing my MA thesis on the networks of economic and social capital which made manhua periodicals possible during this time period,3 most of these names are very familiar to me. 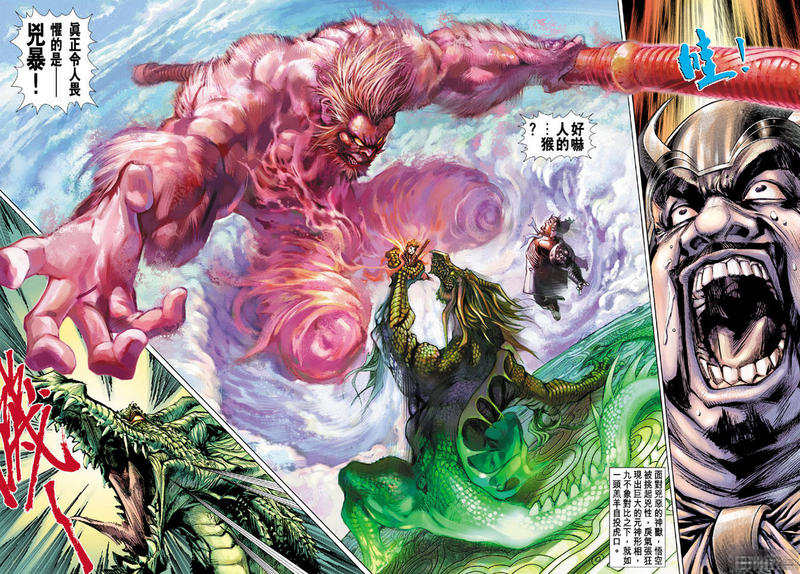 Wang’s illustration, however, is the first time I’ve seen them all in one place. 122. 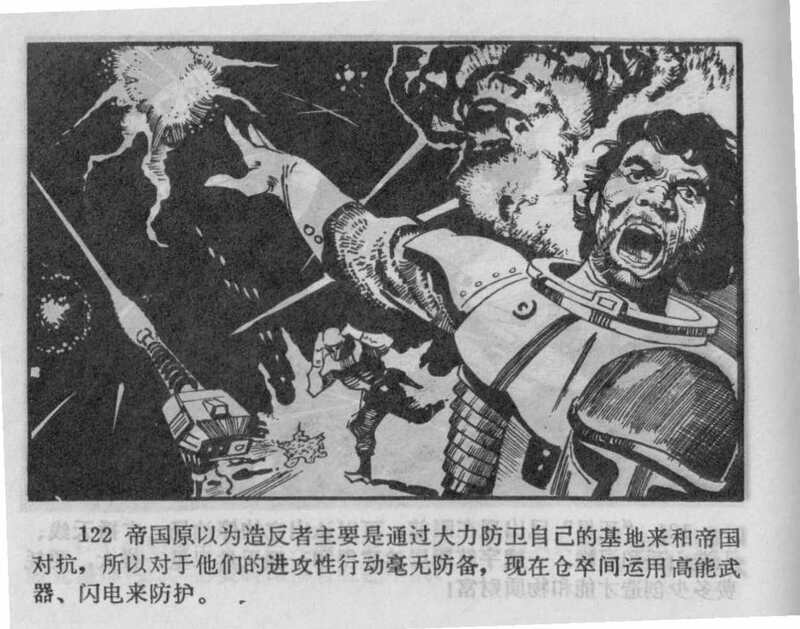 The Empire originally thought that the Rebels would have put all of their energy into defending their base, so they are entirely unprepared for the [Rebel] offensive, forcing them to rush to employ high-energy weapons and lightning (shan dian 閃電) to repel [the Rebels]. 123. The Rebel fighters fly back and forth, firing upon the [radar] equipment [and gun arrays] on the “Death Star.” Luke’s sharpshooting leaves a string of fireballs across the sky. 124. But Luke’s spacecraft can’t turn in time, forcing him to fly directly through the fireballs. Luckily the space craft can withstand the extremely high temperatures, allowing Luke to escape by the skin of his teeth. 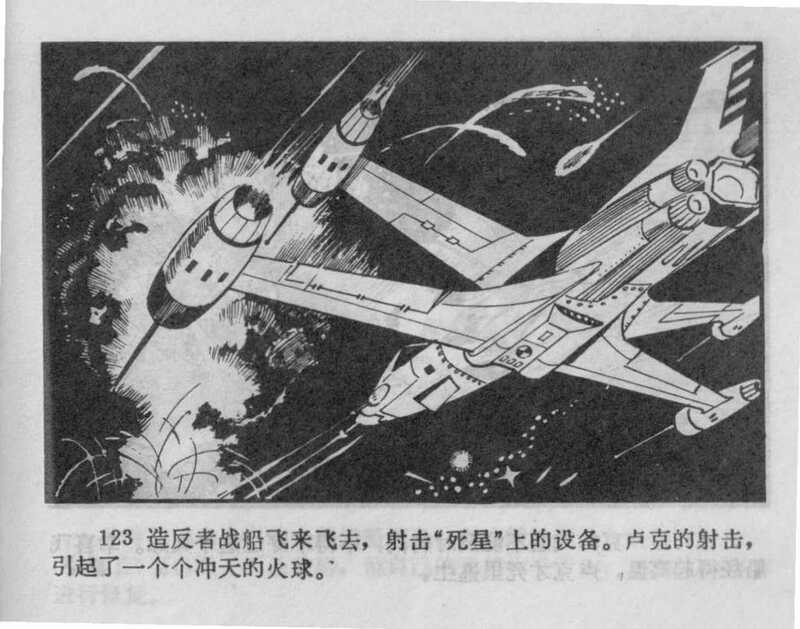 Chinese Star Wars Comic (Part 5 of 6): We have to destroy the Death Star! 100. Luke takes out a small communicator and impatiently yells for C3PO, but he gets no response. Just as all four of them are about to be crushed by the walls of the garbage chute, C3PO’s reply is transmitted [through the radio]. 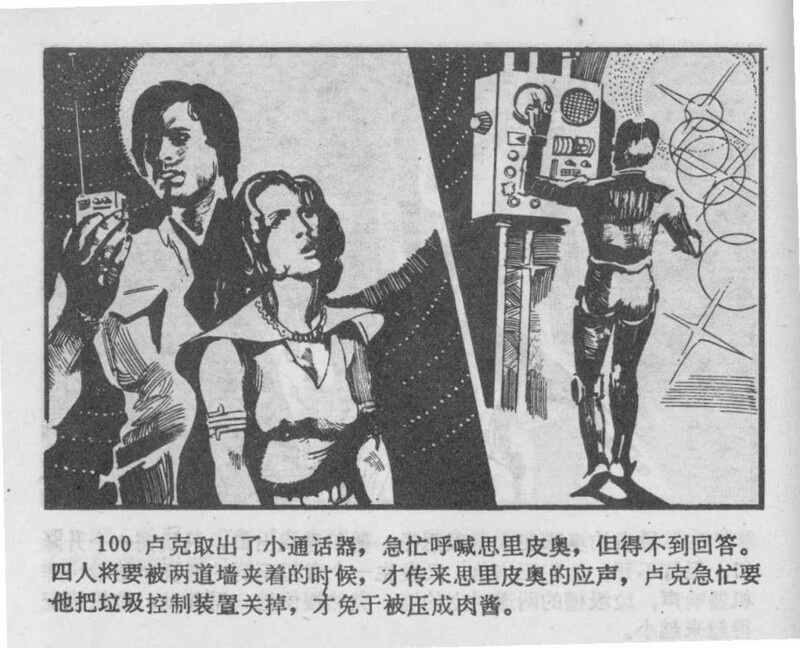 Luke quickly asks him to turn off the device which is controlling the garbage chute so that they won’t be turned into a meaty pulp (roujiang 肉醬). 101. Once the two walls have returned to their original position, Luke pushes aside the trash covering the escape hatch so that he can see the [garbage chute] number clearly. Right away he radios C3P0, saying, “Open the inspection hatch for [garbage chute] 336-191.” In this way they are able to escape from the garbage chute. 102. But as soon as they enter the corridor they run into the Imperial Stormtroopers again. Solo takes Chewbacca to fight them off while Luke and Princess Leia run off down a side corridor only to discover a bottomless chasm blocking their way. With no way forward and the enemy close behind, what can be done? 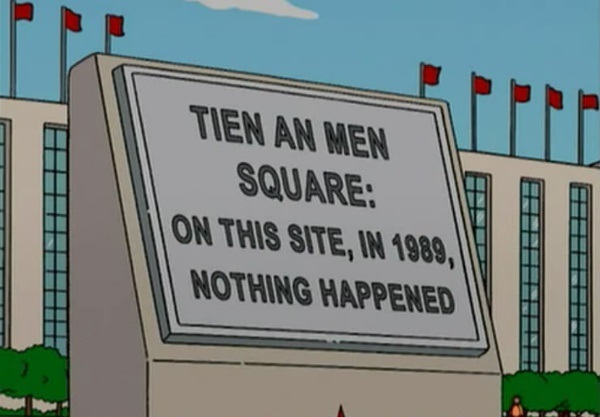 Simpsons Episode 12 “Goo Goo Gai Pan,” Season 16, aired March 13, 2005. On the other hand, as someone who is passionate about Chinese literature and culture, I often find myself frustrated with the extent to which the discourse on China is dominated by 6/4. Chinese literature in translation, in particular, seems to be almost singularly restricted to works which are “banned in China.”5 This leads to a very skewed perspective on Chinese popular culture in North America, which is in many ways every bit as vibrant (and trashy) as popular culture anywhere else in the world. Romance, horror, mystery, and sci-fi are all thriving, both on the internet and in bookstores. And even “serious literature” is thriving, too: two of the most popular novels in translation are 1984 and One Hundred Years of Solitude. That said, there are many accounts of 6/4 which do an excellent job of placing it in a larger historical context. I personally think autobiographical comics and animations are well suited to this purpose. Memory is incredibly subjective, and photographs have a tendency to seem much more objective than they often actually are. When we look at a drawing of a memory we are forced to acknowledge that memories are created and re-created over and over, rather than being preserved like fossils waiting to be unearthed.